Beyond CaliFlorida: Watch your mouth! July 16, 2014, 11:24 AM · Swearing in the park – It appears that some deity or other is taking its wrath out on theme park guests lately. I’m sure the deity would like to remind us that taking its name in vain is sure to cause havoc. Last week someone swearing on Ninja at Six Flags Magic Mountain caused the deity to fell a tree on a calm and clear day and place it in the way of one of the trains. This week it was hitting the Walt Disney World monorail line with a lightning bolt. What is it going to be next week? I’m concerned for all of you that if we don’t get this swearing problem under control, we are going to have some people seriously injured this week. Please, for the sake of yourselves and others around you, try to use words that sound like dirty words if you must, but aren’t, like duck, sit, pass, manhole, funk, lemon, schnitzel, and others. We need everyone’s help to get this under control while we still can. An angry deity is a vengeful deity. Theme Park Apprentice – Those wishing to participate in this summer’s Theme Park Apprentice design competition should keep an eye on the discussion board. I hear there is going to be an announcement for signups in the next couple of days. 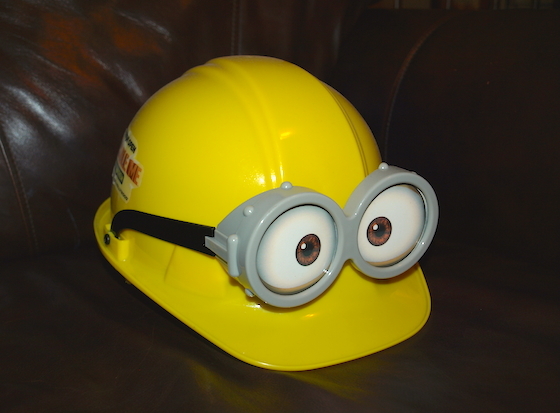 And we have an appropriate prize for the winner of this round of the Theme Park Apprentice design competition: the coveted Minion Hard Hat! Kings Island – The park has filed plans for a 5,000-square-foot building back by the Beast. I hate to think that they are building something that we don’t quite know about just yet. Although my guess would be a similar dark ride/roller coaster attraction as the new Wonder Mountain’s Guardian that just opened in Canada’s Wonderland. Cedar Point – We are hearing rumors that Challenge Park is going to be shut down to allow Soak City to expand with water rides moved from Geauga Lake’s Wild Water Kingdom. I would also guess that they might get a 5,000-square-foot building as well. In other news, one of Cedar Point’s roller coasters is possibly going to be renamed to King James. If we are going to rename any coaster for an excessively paid, self-aggrandizing, home-ditching basketball player, then I can’t think of a better coaster to rename than Mean Streak. Tokyo Disneyland – The Once Upon a Time Castle Show is now playing. Kennywood – We love when we get the locals' view on their own amusement park. Although I have always wondered about a place that calls itself a Pitt. Where I live “Pitt” is a dark dank place that you wouldn’t want to go to. Although maybe there is something lost in the spelling and the one I am thinking of is “pit” and not “Pitt.” If that is the case, then I really don’t understand why they like Brad so much, I mean his wife is good looking and all, but you wouldn’t catch me walking around with a shirt that said Affleck or Sudeikis. Kentucky Kingdom – While it is nice to see the guests so happy and energetic about the new park, I can’t help but think that maybe they put something in the water to make people move around that fast. Help Wanted – To work in a theme park, it’s always nice to know a skill. Frontier Village – Here is a video reminiscing about Frontier Village by the people who used to work there. July 16, 2014 at 11:38 AM · Those 5,000 square foot buildings are most likely for Halloween Haunt mazes. That's a tiny amount of space for any type of attraction---5,000 square feet a little larger than a basketball court, perfect for a Haunt attraction, but not even big enough for a three-scene dark ride. BTW, is that an ANSI-cerified hard hat? I would look pretty cool trekking to a job site in that. July 16, 2014 at 12:14 PM · Dr. Nefario says it's fine, Russell. You trust him, right? July 16, 2014 at 8:14 PM · And Kennywood once had a drop ride called, appropriately, "Pittfall". But alas it is no more....But it is a gem of a park. Probably the best collection of old time wooden coasters and attractions that now only exist at Kennywood. Plus, it's beautifully landscaped, has mostly free parking and the food is quite good. Before all the iron coaster parks came into existence, the NY Times had named it the Coaster Capital of the World. July 16, 2014 at 9:46 PM · Signups for Theme Park Apprentice 6 have been posted on the discussion board! I'm with you as a fan of Kennywood. It reminds me of what Elitches used to be before they moved it.